We’re working with Shoe Carnival in their search for a Search and Display Marketing Manager in Evansville, IN. Shoe Carnival is a chain of over 417 footwear stores located across 35 states. Combining value pricing with a highly entertaining store format, Shoe Carnival is a leading retailer of name brand and private label footwear for the entire family. 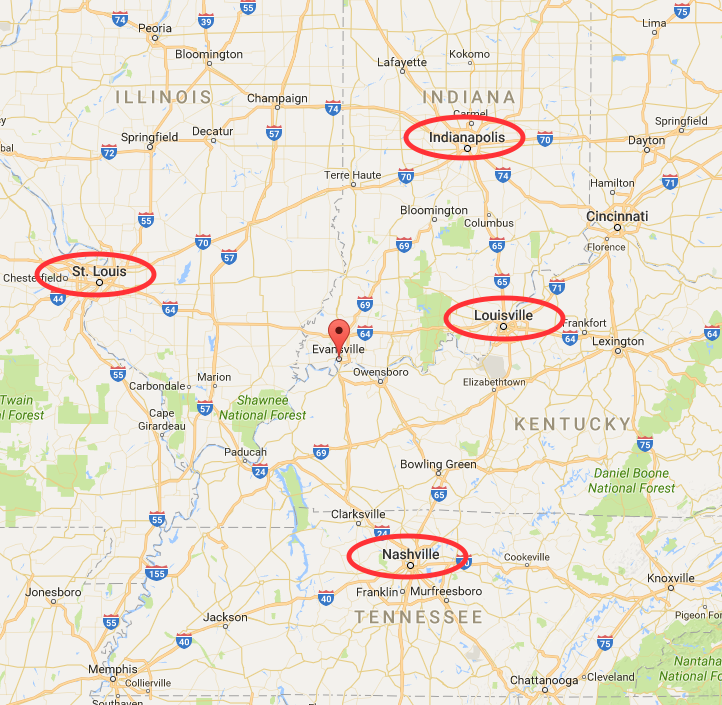 Evansville is the third largest city in Indiana and it lies within a 200 mile radius of four major metropolitan cities: Indianapolis, Nashville, Louisville, and St. Louis. It’s not in the middle of nowhere. It’s the heart of the midwest — and it has America’s second lowest cost of living. Now then: If you’ve never worked in footwear, it’s an online marketer’s paradise. The US shoe store industry includes ~25K stores with annual revenue of about $34 billion. Demand is driven by new styles and personal income. Profitability hinges on smart merchandising and competitive pricing. National chains like Shoe Carnival have advantages in purchasing, distribution, and marketing — while regional and local chains compete by stocking specialty products and localizing customer service. Just 50 companies account for 80% of industry’s revenue. Shoe Carnival expects to reach $1 billion in sales next year, up from $800 million just 2 years ago. The firm expects to add dozens of stores per year in the next 10 years, taking it to 700 stores total. The company has nearly tripled in size in the past 12 years, and every major metric is headed in the right direction: Number of stores; Sales; Revenue growth; number of states with stores; number of employees; and more. Shoe Carnival has NO DEBT and has plenty of cash in the bank. In addition to selling famous name brands, Shoe Carnival offers private label products. The firm prides itself on being a family footwear retailer primarily to the mid-market, and its “open inventory” concept has allowed it to differentiate itself with self-service value backed by incredible staff support. Shoe Carnival’s stores are famously interactive, often featuring an in-store emcee on a microphone announcing specials, engaging guests with crazy trivia questions to give away merchandise, and doing different things to interact with customers to personalize the experience and make it just plain fun. This shopping-as-entertainment concept has worked like a charm because consumers WANT a gratifying shopping experience (duh! ), which might explain why such a high percentage of SC’s SEO / PPC advertised coupons are redeemed in stores. As SC’s new Search and Display Marketing Manager, you will be responsible for the planning, execution, optimization and analysis of the company’s search and display programs to align with SC’s overall digital marketing strategy. That means you’ll be partnering with internal and external teams to develop content, promotions, and customer contact strategies that drive traffic online and in stores for the purposes of awareness, retention, and acquisition. You’ll need to bring to this ecommerce job a solid methodology for both SEO and PPC. Anybody can do keyword research. This job involves more than that. We’re looking for an A-player who can work with SC’s Merchandising team to get a sense of which products should be promoted when, through what paid digital channels, and for how much. GOOD NEWS: You’ll have an agency by your side. You’ll team up with SC’s agency to guide and challenge their work while giving them a deep understanding of SC’s audience segmentation approach as it pertains to PPC and programmatic display advertising. You’ll find yourself creating custom audiences in Google for use within the Oracle Data Cloud, and from there you’ll help build high-octane CRM files based on SC’s transactional data. There’s boatloads of information we can share with qualified candidates about SC’s data co-op and how customer profiles can be pushed into platforms like Facebook, Instagram, and Google. It’s pretty slick. Plus, in a business like footwear, nonbranded search can produce stunning new-to-file growth, so there’s a giant opportunity for you to make a name for yourself while working with some of the smartest ecommerce executives in the IR-500 / Shop.org community. Early on, SC will expect you to assess the current state of the firm’s organic and paid search channels: “What’s working? What’s not? What is trending? Where do we go from here?” You’ll find yourself reevaluating SC’s performance marketing budget and forecast and implementing strategies to drive the business forward. Bring your project management A-game. Later, the team would like to see you leveraging your already-strong relationships with Google and Bing as you get Shoe Carnival in on the ground floor of Google’s hottest new alphas and betas. What could be cooler than that? A FINAL NOTE: This client’s culture is extremely analytically oriented! Shoe Carnival’s execs know how to count and they manage to the numbers every single day. They benchmark everything and they know what’s working in their business (and what’s not). Accordingly, in your interviews for this ecommerce job, be prepared to get nitty-gritty with the hiring committee regarding your search and display marketing successes — and failures. Additionally, plan on giving SC a breakdown of the biggest challenges you have faced so far in your digital marketing career. As usual, we have a crazy amount of proprietary information to share with HIGHLY QUALIFIED candidates regarding this client’s industry, culture, underlying economics, and ecommerce strategy. Our market research alone for this search exceeds 50 pages! Believe me, you don’t want to apply without this intel. To request this packet of research, CLICK HERE. Or simply use the link at the bottom of this page. Manage the Shoe Carnival Pay Per Click Program and liaises with agency to plan, develop and execute on search engine campaign strategies that drive traffic and sales both online and offline. Drive growth in the program through analysis, testing, optimization, competitive research and keyword expansion. Manage PPC budget and liaises with agency to maximize RoAS across campaigns and ad groups. Build out local search campaigns that drive traffic and sales to retail locations. Collaborate with internal teams for promotional and product planning, customer contact strategy/segmentation and creative content/messaging. Stay abreast of the latest advancements and trends of pay per click marketing. Develop and monitor a keyphrase list that is relevant and provides the greatest opportunity for driving traffic and conversions both online and offline. Develop SEO forecasts for online traffic and sales. Identify and partner with Ecom to resolve SEO issues with the website such as duplicate content, redirects, crawl errors and site speed. Make recommendations to Ecom for navigation, site layout, copy, images, etc. as it relates to better SEO rankings and qualified traffic. Collaborate with internal stakeholders to drive exposure to store pages from “near me” searches. Analyze campaigns and translate quantitative and qualitative data into recommendations and plans for revising social media, affiliate and content marketing campaigns. Stay abreast on the latest SEO trends and algorithmic updates. Manage, executes and optimizes acquisition and retention campaigns through programmatic display, retargeting, video and mobile. Manage the DMP/DSP relationships, programmatic budget and collaborates on building plans and forecasts. Collaborate with marketing team and DMP to develop custom CRM and prospective audiences. Drives growth in the program through continuous testing and result analysis identifying actionable opportunities (e.g. audiences, creative, etc.). Stay abreast on industry trends and opportunities in the programmatic marketing space. Bachelor’s Degree or commensurate experience in search marketing, programmatic display and/or other digital marketing. 3-5 years of search and display marketing experience (preferably with a multichannel retailer), with a demonstrated track record of success in developing and managing direct response campaigns. Display in-depth knowledge and understanding of the major search engine platforms (Google and Bing) and their capabilities. Experience with utilizing research and analytical tools (e.g. Google Analytics, Google Search Console, Brightedge, etc.). Expertise in brand and data-driven marketing, customer segmentation and prospecting. Experience with setting up and optimizing programmatic display campaigns through providers such as Google Display Network, Mediamath, Doubleclick, etc. Be a team player with the confidence to take the lead and guide other key stakeholders when necessary (e.g. content/creative ideation and development, audience development, etc.). Excellent communication skills (written and verbal), both in articulating his/her ideas and gathering input from key stakeholders. Intermediate skill level with MS Office (primarily Excel).